This week’s Snippets is a “General Update” edition. Please visit www.crsd.us, attend a local Advisory School Board or CRSD Board of Education meeting for more news and information. Also, please visit our Facebook page for student activities related pictures and news. Thanks to the hard work of CRSD’s Tech Coordinator Chris Van Wyhe and a few volunteers, CRSD athletic events are now streamed via www.crsd.us/stream.html. Events hosted in the CRSD are streamed live. Activities hosted outside the CRSD will either be streamed live or recorded and uploaded later, depending on the venue’s internet access. When you visit www.crsd.us/stream.html, you can view any live-streamed event or recorded events. If you would like to volunteer to operate the camera for a student activity, please contact the school’s athletic director (Kenny Lake-Rick Oatman, Glennallen-Ben Dolgner). CRSD staff have been working to have each of our facilities designated as an official American Red Cross Shelter. This designation not only provides enhanced services during a disaster or accident, but may provide an opportunity to receive grant funds for generators and other contingency equipment. Kathi Hindman, a local expert in emergency response, is coordinating our paperwork and may be reached at emsfirekat@cvinternet.net. Here’s a fun way to involve students in local conversations regarding Alaska’s unique energy challenges and opportunities. There will be an AK EnergySmart training workshop on Thursday, November 12th at 3:15PM – 4:15PM in the Glennallen High School video-conferencing room. The training will broadcast via video-conference to Kenny Lake and Slana Schools. Teachers, home educators, and community members are invited to this active workshop to learn about the energy landscape of Alaska, how to integrate energy education into what students are learning, and how the FREE AK EnergySmart curriculum can work for you! This Alaska specific, standards based K–12 curriculum boosts students’ energy literacy. Students investigate what energy is, how we use energy, and how energy can be conserved. You can learn more at www.akenergysmart.org or by emailing Katie Croft at education@realalaska.org. The new Copper River School District high school schedule continues to develop with Trek #2 this week. Students will extend the learning they began in Trek #1 during the next two weeks of intensive classes. We continue to solicit feedback from students, teachers, and parents as we create a schedule with as many vocational, outdoor and local-interest courses as possible. Many thanks go to our staff, students and community for their willingness to try something new and demonstrate that we can have a high-quality education program in the Copper Valley that is uniquely Alaskan while preparing students for college and/or career. As reported in previous Snippets, reports from last Spring’s Alaska Measures of Progress assessments have been delayed. Last week, the Department of Education and Early Development informed superintendents that statewide data from the tests will be released on November 9th. Districts will receive electronic access to data prior to the public release. Printed versions of individual student reports will be sent to districts later in November and then mailed to parents. If you have questions regarding AMP reports, please call or email your child’s teacher or Principal. 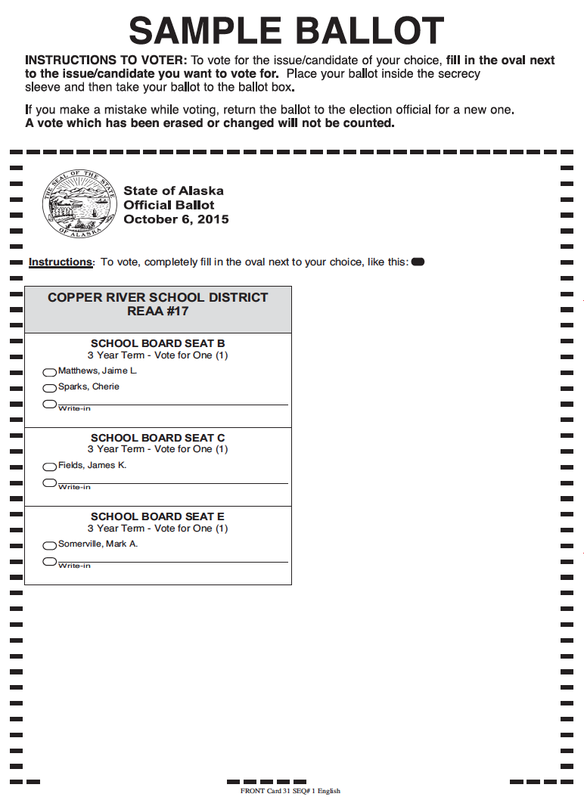 On Oct. 23rd the Alaska Division of Elections certified the REAA #17 School Board Elections. James Fields and Mark Somerville were both re-elected to three year terms. Jaime Matthews was newly elected for a three year term. She has served on the Glennallen School PTO and ASB for several years and is an active hockey Mom. The next time you see Jaime, please congratulate her and express your appreciation for the time and energy she will invest for CRSD students. The recent election also concludes Cheryl Sparks’ 21 years of dedicated service to the Board of Education. That’s over 250 monthly Board meetings, not including committee meetings, interviews, and special meetings. Cheryl has been a steady and reliable supporter of CRSD students and staff. Please stop by the store or send Cheryl a note of gratitude. Mrs. Sparks plans to remain involved in the CRSD by volunteering at Glennallen School. Unusual for this time of year, we have colleagues who will be retiring mid-year. Ramona Henspeter is retiring from Upstream Learning. She has been with the program since 2009, building it into the family-centered program it is today. See last week’s “Meet the CRSD” for more about Ramona. Loreen Kramer will also be retiring this December. Loreen has been with the CRSD since 1987 starting as a secretary for the Assistant Superintendent. Loreen has kept the district fiscally sound through challenging financial times, dropping enrollment and the exponential expansion of restrictive regulations. Both Ramona and Loreen will be here through the first week of December, so please stop by their offices and wish them well. 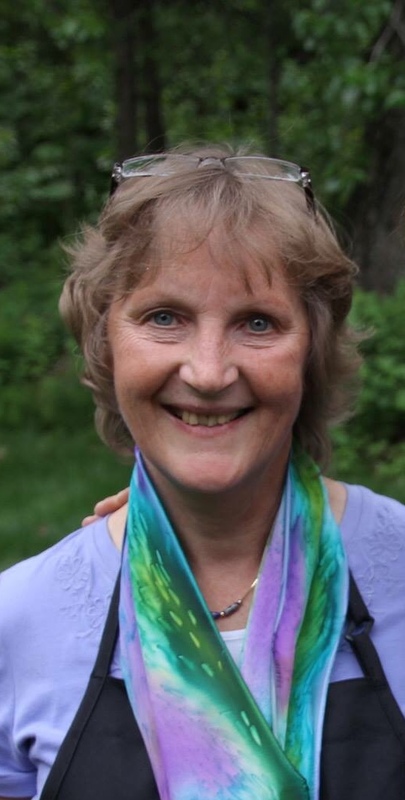 Earlier this month, Kathi Hindman retired after 21 years of dedicated service to the students of the CRSD. In addition to helping students learn to read, Kathi led our efforts to establish emergency response plans, taught CPR to staff members, and represented the district on the local Emergency Response Planning Committee. While transitioning to a full-time emergency responder, Kathi is helping to establish each of our school sites as an official Red Cross shelter. Thank you for reading the Snippets. Together, the Copper River Valley is providing a quality education in our wonderfully rural and unique environment. Each month the CRSD Snippets will highlight one of our dedicated employees. We will randomly draw a name so that every employee in the district has the opportunity to be recognized for his or her unique and essential role in providing a quality education in our rural environment. This month, we are pleased to present Barb Doty. Favorite Place in Alaska: Kenny Lake. It is home. It is beautiful, peaceful, magnificent and the people are wonderful as well. Favorite Place Outside of Alaska: Germany. I lived there for about 2 1/2 years and it was an amazing experience. Favorite Aspect of Teaching: Being able to greet the students when they get off the bus in the morning with a smile to get their day started. I am Blessed to have a great staff to work with. One Interesting Thing About You That Might Be Surprising: I find pleasure in being able to do something nice for someone else. In One Sentence, What Advice Do You Have for Students? Do not get behind on your school work! 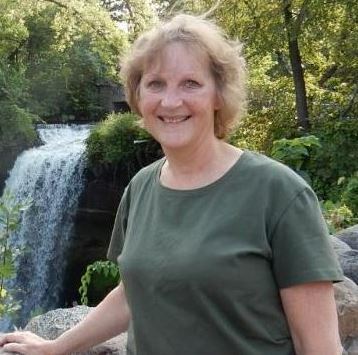 Barb Doty started working in the Copper River School District in 2006. Ask anyone at Kenny Lake School and they’ll quickly tell you how hard Mrs. Doty works to keep things running smoothly. Send Mrs. Doty an email, buy her a coffee or take her a can of nuts to let her know how much we appreciate all she does to serve students and families in the CRSD. Who doesn’t like Legos? Mom and Dad may not like Legos very much after stepping on one, but other than those occasions, even adults like to build things with Legos. I loved Legos when I was a kid. I still like them. Legos are a very versatile toy. If you’re playing hot wheels, you can make garages. If you’re playing dolls, you can make a house. If you’re playing army and need to bomb the enemy, Legos can serve as both the ammunition and target. This past Christmas, we, and I do mean kids and grown-ups, enjoyed several new boxes of Legos. (FYI: Grandparents sometimes don’t know when to quit buying.) My job during construction was to locate the small, hard to find pieces. While watching the building process, in this case an airplane, Legos reminded me of the progress and pitfalls of the 21st century’s version of curricular resources. When I was young I remember Legos coming in a big box. We had to use our imaginations to build something. These days, I think too much imagining is done for kids. Now, most Legos you buy still come in a box, but typically with a picture of something from the latest movie. In the box there is a little booklet with step-by-miniscule step instructions. The imagining comes after the building. When I was a kid, even the building part came from our imaginations. Technology advancements, whether in Legos or education, offer many benefits, but we must be deliberate. We know this from our experience with other technologies. The automobile, for example, is a wonderful technological advancement and has no doubt improved our lives. But even something that we now take for granted did not come without pitfalls. Our great-great grandparents walked more. They visited longer when they went somewhere. Before cars, people were more thoughtful about where they went and why. We weren’t dependent on oil and there was less smog. Over time we have recognized some of these drawbacks and worked to minimize the negative impacts. Research and development were applied to exhaust systems to make emissions cleaner. Cars are getting more and more fuel efficient. We are constantly encouraged to exercise. Technology will continue to advance, but so should our understanding of how it impacts our lives. If not careful, educational technology can become like instructions in a new box of Legos. Kits are great, but they should nurture imagination and creativity, not replace them. Likewise, in order to nurture students’ creativity and imaginations, we should be specific in what we teach them about English, Math, Science and History. Technology in the CRSD benefits the learning process through accountability, access and media. I’m extremely proud of our teachers who are using it skillfully while minimizing the drawbacks. Teachers are spending even more time interacting with individual students regarding content and learning skills. In some cases, teachers have used technology to foster cooperative learning with classmates and even Skype in famous authors from far away places. Like the car, educational technology will offer exciting opportunities and take us places we could not go without it. We just have to make sure we know where we want to go and drive carefully. The next time you see Legos, buy a box and use them to teach your student a valuable lesson. As they’re building their new toy, tell them that’s the way school should be. Legos don’t build themselves. Their teacher will provide the blocks or show where to get them, but students must do the building. Talk with your child about the benefits and drawbacks that technology has in school, at home, in science and in other parts of society. And then, after they’ve played with the new Lego toy, take it apart, put the instructions away, and see what they can imagine. 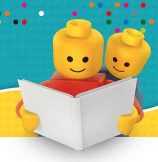 Now, whether you admit it or not, you’re itching to go build something with Legos. School Board elections often fly under the radar. The ballots often arrive during the busy hunting season and must be submitted by mail. According to the Alaska Division of Elections website, turnout for the 2014 school board elections was 13.21% of the registered voters. Thank you for the opportunity to serve our community, teachers, staff, and students by running for the CRSD Board of Education. I have been a very active parent in the CRSD the last nine years, playing various roles in our PTO, Advisory School Board, Technology Advisory Committee, and several of the activities my children have been involved in. As a future board member, I look forward to providing input and working alongside the administration on the challenges and opportunities our district faces. Decreased funding and increased regulation are two big challenges. It is important to be efficient and get the maximum benefit out of each dollar for the district as a whole. As more regulation is implemented, this is a burden on smaller schools. Finding a way to partner with other school districts would allow the CRSD to meet the regulations at a shared cost. Although we have some challenges, we also have many opportunities. A great community combined with wonderful teachers help shape our students to be responsible, well educated adults. Education is always changing and I look forward to helping shape that change for our school district. As a member of the CRSD Board of Education, I would like to continue working for the community by creating a stable board presence. I feel continuity in any environment is very important so that you can continue to grow your programs. Right now, even in a very unstable economy, the school district is continuing forward, bringing more opportunities for students. Forward thinking in a fast paced, ever changing world is the challenge that our staff at the school district faces every day and are doing an excellent job at meeting head on. They have increased the student numbers in the vocational education classes by moving away from the traditional class schedule to a new innovative schedule. Offering more online classes and academies through Chugach has opened many more opportunities than would ever have been possible in a district our size. I would like to thank everyone that has supported me in the past, and would ask again that you give me the opportunity to be a part of the great team at the Copper River School District. As a member of the CRSD Board of Education, I will continue to work towards improving the opportunities of our students and also work toward increasing student achievement. In a time of financial uncertainty it is critical that the CRSD continue to improve what we have now, and also be looking at what’s next in education. The Copper River School District is known throughout the state as a district of high integrity both in administration and education. It is my goal to continue pushing our district in a direction that will benefit every student that has the opportunity to be educated in our great district and community. Increasing achievement in every student is a task that takes much more than board members; it takes every person in the school and community. It takes a culture surrounding students that says, “we expect more and we will help you get there.” That’s what I want every student to feel. I want the Copper Basin to have a culture of high expectations for our students so that they can achieve more than they think they can. Please help me in making this a reality in every student’s experience here in our community. I have lived full-time in the Copper Basin since 2006 and my three children attended Kenny Lake School from grade school through graduation. I have served on the CRSD Board of Education for three years. Over those 3 years the CRSD has gone through significant changes. Enrollment has dropped in all our schools; state standards have changed with increased expectations for our students and teachers; our curriculum materials have become outdated and required renewal; and our budgets have been greatly reduced. These changes have required the CRSD to seek new directions and most importantly new resources through which to provide content to our students so they may graduate prepared for their futures, whether they be college or workforce bound. The future for the CRSD looks to have many of these same challenges to contend with. My role as a school board member will be to review and vote on the direction the district will go to overcome these challenges. The CRSD must provide the broadest and most challenging opportunities it can for our students. We must also ensure our schools remain the integral part of the community they have always striven to be. On behalf of our students and community, I offer a special “thank you” to each of the candidates for running for the CRSD Board of Education. Please remember to send in your ballots by October 6th. As we get ready for a new school year, our minds naturally turn to academics, homework, and all the learning that should take place to move from one grade to the next. Before we jump into the normal back-to-school routine, let’s spend some time thinking together about another equally important aspect of a quality education. If you look closely at the CRSD logo, you will see our mission statement, “Providing a quality education in a rural environment.” Even now as you read this Snippets, that’s what our employees are gearing up to do for the 2015-2016 school year. They are dedicated to the current and future success of our students. This includes, but is not limited to, academics. However, in order for academics to have meaning in a student’s life, it must be accompanied by character. Before we explore the meaning of character, we should emphasize that last sentence – without character, academic study will have little impact. To visualize the impact of character, let’s imagine that all CRSD students are advanced in every subject area. Every student earns straight A’s, scores high on all achievement tests, and will leave high school fully prepared for college level assignments. Imagine with me that every kindergartner will learn to read without any difficulty. Long-division in fourth grade is a breeze for every student (no tears whatsoever). In junior high, all the students can write well enough to be published in a statewide newspaper. In our dreams, every one of our high school students achieve so highly, they will earn enough scholarships to pay for college. On the surface, this seems like a wonderful vision for our students. However, even if we could make all of the above come true, we would be leaving out what most every parent wants for their child. We would be neglecting something absolutely essential for success and contentment. We would be neglecting character. Without it, all the learning in the world is useless, or even worse, destructive. When we express a desire to provide a quality education, it must include discipline, because character is shaped through self-discipline. Teachers work hard to develop and implement a great instructional program, yet they know that a student’s character makes all the difference in the learning process. Lesson plans for reading, writing and math are essential, but not enough. Character counts. It matters how we behave (for adults too). Achievement without character is empty and unsatisfying. Achievement through character is lasting, satisfying and full. Failure without character leads to bitterness. Failure with character leads to change. Character makes a difference in our suffering and in our success. So, what is character? In a world that shuns absolutes, it can be challenging to establish clear principles of right and wrong. For the most part, in our community we are fortunate to have general agreement on the qualities of good character. On many occasions, I have heard our Elders speak forcefully about character and how it was a value in the Ahtna culture long before the mountains were called Drum and Sanford. I have seen community members demonstrate character. For example, when there is a financial need, you can bet someone is cooking spaghetti to raise money to help. Throughout our community, it is evident that the Copper Valley values honesty, hard work, generosity, personal responsibility, kindness, and forgiveness. Of course there are examples of bad character, but even then, an understanding of grace and mercy are demonstrated in our community when we resist casting the first stone. Character matters, and because it matters, we must do our best to expect good character from our students. 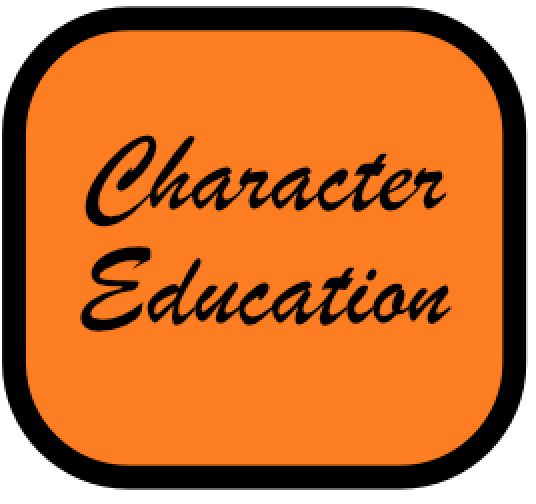 I will be directing our Principals to renew their efforts to integrate character education into our academic program. That will include holding students accountable, not just for their school work, but also for their behavior and attitudes. When I walk into a school, I want to see students learning well, and interacting well. I want Copper River School District students to have an edge in the market-place because of their manners. I want our students to be recognized for both their academic achievement and their politeness. I want our students to observe the truth that one reaps what they sow, especially when it comes to respect. Like most parents, I want our students to enjoy an abundant life built upon the benefits of right choices. This is asking a lot of our Principals and teachers. Being a disciplinarian is hard work and under appreciated. Taking the time to turn a student’s bad choice into a positive lesson takes a lot of time, patience, and confidence. It can be disappointing when the lesson is resisted and motives are questioned. Principals who insist on teaching good character will take some abuse from adults whose own character is lacking. They will be hurt when somehow their efforts to discipline are more severely criticized than the behavior of the students who desperately need loving discipline. Our Principals will be challenged by people who want to excuse poor behavior because of another child’s choices. In seeking to raise the standard of behavior, they will be challenged at every turn, and yet, if character matters, then so does enduring the extra conflict. I will ask our Principals not to be harsh, but to be gracious, firm, and resolute. In the end, learning character and learning academics are not mutually exclusive. In fact, I don’t think one happens without the other. If you learn, it is because you invested the effort. The effort is a reflection of one’s character. If you bomb a test, your character will make all the difference in your response. You’ll either go back and try harder, or move on, just to get through the course. You will either ignore an F or work with your teacher to bring your grade up. You will complete your homework, or cheat, based on your character. Those with good character will say “good morning” when they arrive in the classroom instead of sullenly walking past the teacher. Those who are mindful of their character will be respectful of different cultures. One with quality character will work hard to earn good grades rather than feel entitled to good grades. For all of us, character matters when we use our math to give the correct change. Character matters when we write an email that includes information about another person. Character matters when we study history and apply its lessons to current political problems. Character matters when we study science and use new discoveries to ask questions of modern medicine. And especially for we Alaskans, character will matter in how we face our economic challenges, just as it mattered when we enjoyed rich harvests of revenue from higher oil prices. In the coming school year, I hope you’ll support our students by expecting the best from them, not only in academics, but also in character. A student’s basic sense of right and wrong comes from the nurture and example they get from their family at home. Teachers can support families by demonstrating the values that produce good character. If you agree that character counts, please email your school Principal and let them know they have your support. Offer suggestions, volunteer to help teach character lessons, and most of all, be an example of good character for our students. The truth is, the students in our schools already show qualities of good character. The Copper River School District is blessed with wonderful students. Come to a sporting event, visit a classroom and attend a concert and you’ll see for yourself how fortunate we are. Our focus on character this year is not a reaction to problematic behavior, it is our responsibility to each and every amazing CRSD student and his or her enormous potential.